With old age usually comes some changes in our physiological make-up. We tend to get weaker, need more rest among other marked differences. However, in most people, the most visible pointer to old age is the emergence of wrinkles along the face or other body parts. Some other people develop lines along the skin and the body that once was a source of pride, now becomes a challenge that needs to be fixed. In doing so, the use of creams has been suggested. Hence, today, we will be examining DERMA E Anti-Wrinkle Renewal Cream as a possible solution to wrinkles. Does it work? How effective is it? What is DERMA E Anti-Wrinkle Renewal Cream? DERMA E Anti-Wrinkle Renewal Cream is an anti wrinkle cream that is believed to be able to help reduce drastically, the appearance of fine lines and wrinkles on the human skin, leaving it soft and smooth. According to the manufacturer, the cream contains Vitamin A (Retinyl Palmitate), commonly known for its surface cell renewal properties among other skin-useful ingredients that are supposedly healthy and beneficial which could as well promote younger and plumper skin. 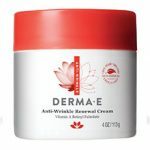 Who is the Manufacturer of DERMA E Anti-Wrinkle Renewal Cream? The manufacturer of DERMA E Anti-Wrinkle Renewal Cream is DERMA E. The company began as a small health food store in Southern California, with their first product a jar of Vitamin E Moisturizing Cream. How does DERMA E Anti-Wrinkle Renewal Cream work? The product is believed to contain Vitamins A and E, and some botanical extracts that might be useful in inducing renewal of cells for a younger and more perfect complexion. These vitamins are believed to be highly potent and gives the skin a rich moisturizing treatment to help enhance the youthful appearance of the skin. It is believed to work well under make up as well as for normal to dry skin types. DERMA E Anti-Wrinkle Renewal Cream Ingredients – Are they Safe & Effective? Microcrystalline Cellulose – A naturally occurring polymer, the refined wood pulp can be used as an emulsifying agent among others. It can also be used in cosmetics as an abrasive and texturizer. Conjugated linoleic acid – Conjugated linoleic acids (CLAs) are a group of naturally occurring isomers of linoleic acid. They are believed to have anticancer, antiatherogeni and antidiabetic effects. Sesamum indicum – With an origin from India, it is the primary source of sesame oil. Sesame oil is believed to contain vitamin E, vitamin B complex and vitamin A which could help nourish and rejuvenate the skin. It has also been touted as being beneficial in management of acne due to its oil pulling properties. What are the advantages of DERMA E Anti-Wrinkle Renewal Cream? The product contains Vitamin A which could encourage  the renewal of cell. The product is believed to be loaded with other skin-beneficial ingredients which might be able to promote a finer skin, making it devoid of wrinkles and fine lines. Some users have acknowledged that the product may enhance the formation of a young and plumper skin. What are the disadvantages of DERMA E Anti-Wrinkle Renewal Cream? The product might not be suitable for day time use as it contains Retinyl Palmitate which is believed to be potentially dangerous when exposed to sunlight after use on the skin . Some buyers have suggested that the product might actually be highly comedogenic. clogging the pores and leaving the face with more blackheads. The product might also make user sweaty during the day. How Should You use DERMA E Anti-Wrinkle Renewal Cream? For best performance, the manufacturer advises that user should scoop a small amount of the cream to the fingertips and then, apply to the entire face, neck and body in light upward strokes. The application should be done twice in a day and may be used under make-up. How Much Does DERMA E Anti-Wrinkle Renewal Cream? A one-time purchase of the product costs $14.95 whereas manufacturer put the product up for sale at $13.46 for subscribed buyers. What is DERMA E Anti-Wrinkle Renewal Cream Return Policy? The manufacturer offers a 100% money-back guarantee if buyer is not completely satisfied with the product. However, they warn that the purchase must have been done on dermae.com as they don’t take responsibility for other non-authorised retailers. Buyer is advised to simply return product along with the original order confirmation or packing slip to the manufacturer within 30 days and the original purchased price of the product will be refunded. Does DERMA E Anti-Wrinkle Renewal Cream offer a Free Trial? The are no known free trial offers for this product. This product poses as one that might be able to turn back the hands of time, returning the skin to old glow and giving it a youthful look. However, the chance that it may not be compatible for daytime use, and the possibility of the product working in reverse order for some people might make careful consideration necessary. Ultimately, we advise that it is best for buyers to spend time looking at other best anti aging creams that may be a fit for body needs before making an order.